"The Greatest War Story of All - Takes rank with All Quiet on the Western Front. She fulfilled in every respect the conditions which made the terrible profession of a spy dignified and honourable. With her medical studies cut short by the 1914 German invasion, her house burned down and her father arrested for suspected‘sharpshooting', it was perhaps unsurprising that the multi-lingual Marthe Mckenna (née Cnockaert, codename ‘Laura') was recruited by British Intelligence. At the time she worked as a nurse tending the wounds of occupying soldiers, and as a waitress in her parents' café in the Belgian border town of Roulers. I Was a Spy! is McKenna's vivid narrative of these breath-taking adventures as she, aided by a gallant band of loyal locals, goes undercover to sabotage enemy phone lines, report suspicious activity or train movements, and even instigate an aerial attack on a planned visit by the Kaiser. This thrilling account goes on to explain how, in 1916, the young nurse was caught by the Germans placing dynamite in a disused sewer tunnel underneath an ammunition dump. She was sentenced to the firing squad and only survived due to the Iron Cross honour received as a result of her earlier medical service . Mckenna was later mentioned by Douglas Haig in British Despatches and was awarded the French and Belgian Orders of the Legion of Honour for her espionage work. This re-issue of a gripping tale of the wartime adventures of a legendary heroine, perhaps ranking alongside the legendary Violette Szabo, is one to be welcomed. Churchill was not the only one who could not stop reading this until 4am! Enid Blyton meets James Bond in a rip-roaring memoir. 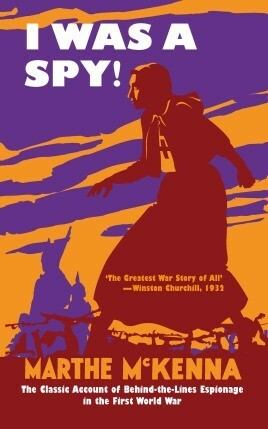 A brilliant first-hand Account of the career of one of the greatest spies of World War I.